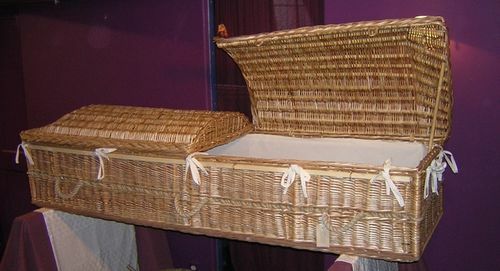 This exquisite woven English willow casket has been created by Darrell Hill's team of weavers at Somerset Willow specifically for the American style viewing with a propped open (or removable) lid. Any size can be accommodated. Allow 8-12 weeks for delivery from time of order. It is extremely sturdy and can be custom-made to any size. Its upper half raises and props open with a plain peeled willow pole. The lower half can be in place or removed, as circumstances require. Its handles are soft hemp rope woven into the sides. It is made to fulfill the Jewish burial requirements and uses no animal products in the glue, no metal parts, and is not made on the Saturday or Sunday Sabbath.